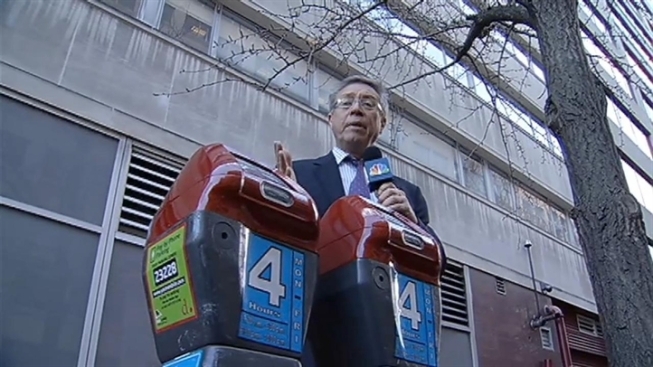 The D.C. Council says it will reconsider how to get disabled drivers to pay for parking at meters next year, News4’s Tom Sherwood reported, but in the meantime, anybody can park at any meter – red top or not – and disabled drivers can continue to park for free as long as they have the proper placards. D.C. spent more than $700,000 this year on its plan to have as many as 1,800 metered parking spaces reserved for disabled drivers. For the first time, they were to pay for parking, but they were to be given twice as much time at those spaces – indicated by their red tops. About 450 hundred of those meters have been installed this year, and the rest will remain in storage. The plan also included harsher penalties for those fraudulently trying to park in those reserved spaces. But the D.C. Council voted down the plan Dec. 4 after months of debate and confusion in the city and did not bring it up again Tuesday, only saying it would reconsider the issue of disabled parking in the future. So at least for now, anyone can park at the red or silver or even the old blue meters once used for disabled drivers. Those red meters could become sought after spots, as they give drivers twice the time for the same price. The city also will continue investigating the use of fraudulent placards.